Since before I can remember (when I was just the littlest suggestion of a loaf inside my mother’s stomach, in fact) I’ve spent my summers at my parents’ house in Italy. High up in the mountains just before the border between Tuscany and Umbria, it’s one of the most beautiful, relaxing places I know. Due – in no small part – to the fact that it’s pretty much in the middle of nowhere. These family summer holidays revolved around a handful of activities: eating, drinking and swimming on a daily basis, with the occasional bit of sightseeing thrown in for good measure if I could be bribed with an ice cream at the end of it. Because we were miles from the nearest civilization, a percentage of pretty much every day would be spent in the car getting from A to B, swimming towels spread on the back seats to stop the hot leather burning our legs, Paul Simon and JJ Cale on the stereo and my brother and I bickering over one thing or another (when we weren’t joining forces to complain about our parents’ dubious taste in music, Paul Simon excepted). On one of these many car journeys, an incident occurred which has become a story my Mum loves to tell. We were driving down the motorway, me not even old enough to speak, when I started to bawl my eyes out. I wasn’t hungry, I wasn’t ill and as far as they could tell there was absolutely nothing wrong. The crying continued to such a point that my Dad eventually decided to pull into a service station so my Mum could jump out and see what was the matter. As she lifted me from my seat she noticed that the tiny label at the back of my t-shirt had wrinkled up ever so slightly and absentmindedly tucked it back in. The crying stopped immediately. This Princess and the pea-like sensitivity is something that has been known to occur in other areas of my life. I’ve always been obsessed with the texture of food, turning my nose up at things that didn’t feel quite right in my hands or on my tongue. One of the foods that I’m particularly fussy about is apples. It may be something to do with my heritage – my Mum’s allergic to them and my Dad grew up on an apple farm – but a bad apple is something I simply can’t stand. When raw they have to be just right, the skin taut and tart, the flesh sweet and juicy and crisp, and on the rare occasions I eat them cooked, the texture has to be spot on, too much mushiness or even a hint of mealiness and I’ll put down my spoon in disgust. When we talk about food, we often group everything into the general category of ‘taste’, taking little time to think about the individual flavours, textures and aromas that combine to create an individual dish. The rise of molecular gastronomy has made us more aware of texture through fancy foams, jellies of this and spherification of that, but I’m talking about texture on a much more basic level, how it contributes to what we taste and to how much we enjoy a meal. Where would a brownie be without its fudgy centre, a steak without a juicy melt in the mouth feel? Imagine an apple without its crispy crunch or ice cream without its slick smoothness and suddenly a lot of the appeal is lost. Apparently the human tongue can detect crystals in ice cream which are approximately 40 micrometers in size. To put that in perspective, one micrometer is a 1/1000th of a millimetre, meaning it’s a pretty tiny crystal that can turn a smooth creamy treat into something substandard, or ‘grainy’ tasting to the human tongue. The recipe below is all about texture and mouthfeel. The apples are cooked just how I like them, thinly sliced, skin on to retain the flavour and heated until soft and melting but far from mushy. 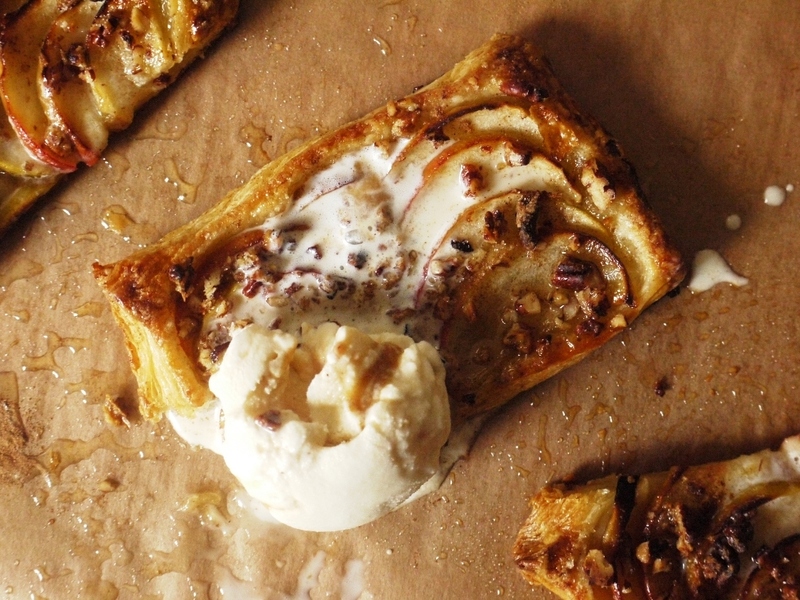 The pastry below is flaky and crisp, lightened by layers of butter and scattered with crunchy nuts which contrast wonderfully with the melt-in-the-mouth apple and smooth, sweet caramel. Served straight from the oven, these tartlets work wonders served with a scoop of the smoothest vanilla ice cream, warm against cold, soft against crunch, creating magical mouthfuls which tantalize your tongue with every bite. Short of serving a shop bought dessert or scooping some ice cream straight from the tub, these tartlets are one of the simplest recipes I can think of, involving just a handful of ingredients and a few minutes of your time. But for minimum effort you can reap maximum reward, and I hope that once you try these lovely light, sticky little mouthfuls of taste and texture, you’ll make them time and again. Preheat the oven to 180 degrees C. Line a large tray with baking parchment. Quarter and thinly slice the apples, then place them in a bowl and mix with the lemon juice to avoid browning. You could peel them if you like, but I think the skin adds a lovely texture and tartness to the dish. Divide your puff pastry into six equal pieces and roll each into a rectangle no more than 5mm thick. Using a sharp knife, mark a border (without cutting through completely) all the way round each rectangle, a couple of millimetres from the edge. Lay your apple slices in two rows, long side to long side, overlapping each other slightly. Brush the melted butter over the tarts, making sure not to knock your apple slices out of place. Sprinkle over the nuts and golden caster sugar, distributing evenly, then dust each tart with a little cinnamon. 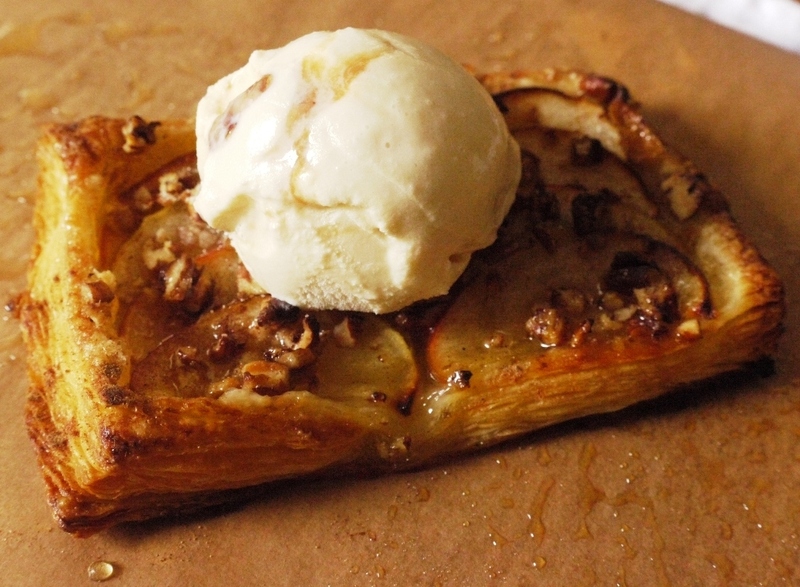 Bake for 20 – 25 minutes, or until the pastry is puffed and golden, and the apple slices soft and caramelized. 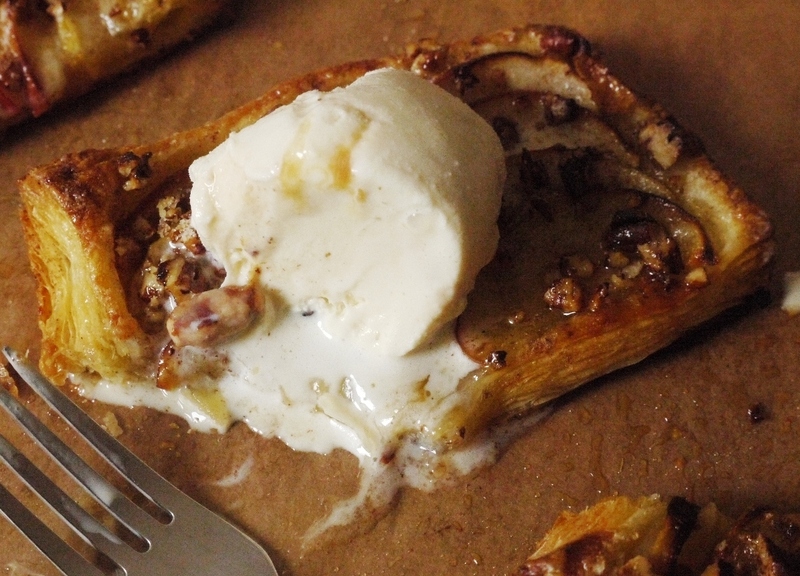 Serve warm, drizzled with a little honey and accompanied by a big scoop of vanilla ice cream. I completely agree with you about texture, I am far more fussy about texture than I am about flavour in a lot of things which is sometimes very difficult for people to understand! What a lovely combination of flavours (and textures) in these little treats! Haha, fussy little girl. I’m with you on apples though – when I buy one I squeeze it as hard as I can, if it gives even a little bit, I don’t buy it… I may have slightly ruined the other apple, but I avoided disaster… By the way, these tartlets look incredible. They would be GONE in a minute if I baked those gorgeous tartlets! 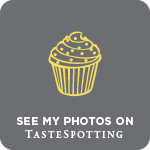 The Single Gourmet & Traveller – thank you! Sasha – aw, thank you! Angie – haha, yep, they pretty much were! Absolutely going on my ‘to bake’ list – thank you! LOVE LOVE LOVE THIS. there’s sth about apples cooked with cinnamon, that smell, that really gets me excited. 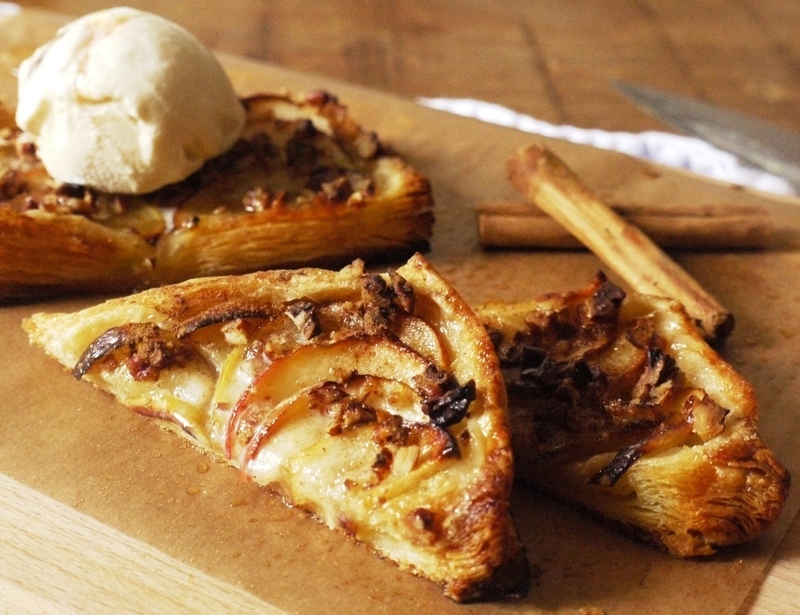 it’s a must for my apple pie, but it’s such a good idea using flaky puff pastry instead of shortcrust, to make tarts like these. Yum! My friend and are I collectng apple recipes ready for the sheer voume she gets in the autumn so this is now on the list to try when they are in season. You really do enjoy the melting ice-cream I can tell! i so agree about texture! we often ignore it and it’s so important! i love that part of italy – where i am in the south it’s beautiful but not as rustic and charming. 🙂 i must try this recipe! Make Do Spend – enjoy! Cake Boule – the melting ice cream is one of the best bits! Nic – haha, glad you like! I’m not the pickiest eater but if I ate this tartlet it would probably ruin me for all others! I hate when I’m anticipating biting into a fresh apple or into a slice of tart/pie and the apples turn out to be mealy. It’s so disappointing. Everything about this looks crisp and buttery! Gorgeous! The apple tartlets and that bit of rural Italy. Identify with you completely on the texture. Becs – absolutely, apples should be sharp and crisp and delicious. Sacha – crisp and buttery is exactly what I was aiming for! Holy crap..I think I just let out a sigh of delight when I saw these! My BF had a similar dessert in France last year…but topped with caramel mousse and vanilla ice cream. He sent me like three cell phone pics of it lol I think I want to surprise him with these! 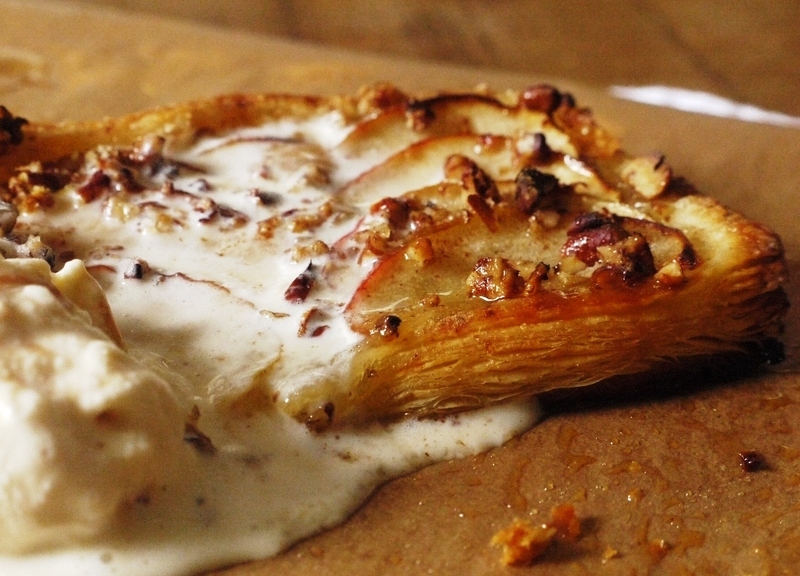 I am not a big fan of apple tart normally but these look amazing and your description has sold them to me. Should we call you Princess Little Loaf now?